Special thanks to Valerie Backus and Temecula Valley Unified School District for hosting the event. Cybersecurity 1 is taught by Mr. Yui Shin and Steve from GBSI who lectures from Florida. SBCSS ROP Adult Correctional FacilityTeachers (left to right): Brian Cortez- Introduction to Construction: NCCER Safety and Painting Occupations (at SBCSS ROP Juvenile Court Schools), Keith Cortez- Custodial Occupations and Natalie Lovato-Rodriguez- Culinary Arts and Food Service Occupations. ROP and TET staff with Assemblyman Marc Steinorth, California 40th Assembly District (second from the right). Hesperia Dental Assisting students competed at the California HOSA Future Health Professionals state leadership conference and competitive events in Anaheim. As a result of their success Hesperia Dental Assisting students are moving on to the international competition in Dallas. Special thanks to Dom Gagliardi and Escondido high School District for hosting the event. CyberSB opened with its first class Cybersecurity 1. CTE Leadership Network and Advisory Meeting, February 7, 2019 in Carlsbad. 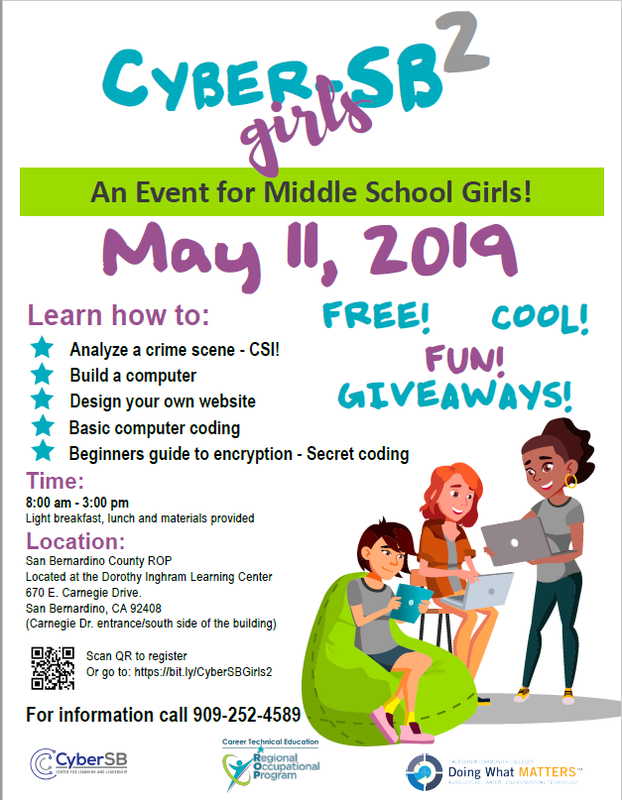 CyberTech Girls Workshop, April 21, 2018, San Bernardino Valley College. CyberTech girls building their own website. Fred Jones - Tools for Teaching training, February 28, 2019. CACTE High-Quality CTE Leadership, April 12, 2018 Thank you North Orange County ROP for letting us use your beautiful site! CyberTech Girls Workshop, April 21, 2018, San Bernardino Valley College. CyberTech girls using digital forensics. Cybersecurity 1 students are watching the live Cyber Threat Map which shows actual cyber attack locations. 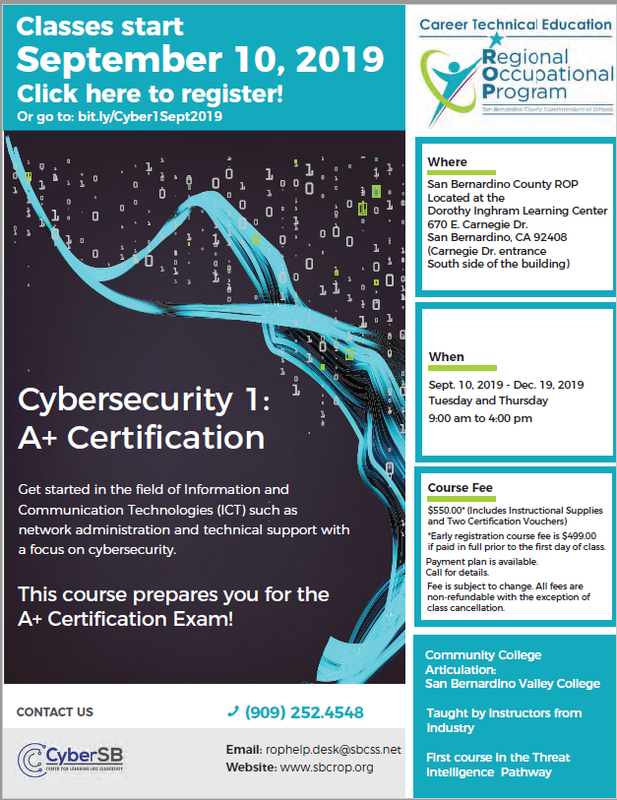 Public Safety Academy sent students to take Cybersecurity 1 classes at the new CyberSB facility. Back by popular demand! Click on the flyer for registration information!